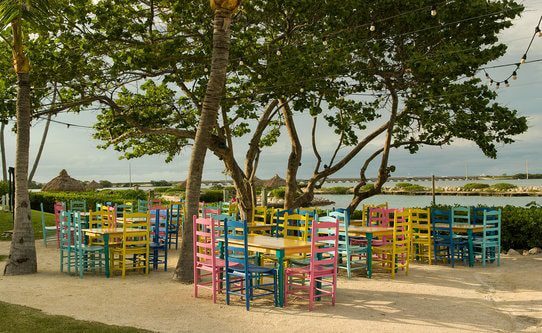 If you’re looking for a kid-friendly place to visit with the kids during these cold winter months, think about a visit to Hawks Cay Resort in the Florida Keys. Hawks Cay sits on 60 acres on the islet of Duck Key. The hotel has a grand, majestic presence, with stunning views of the Atlantic Ocean. The pleasant staff and wide slate of activities enhance the beautiful setting for families with kids of all ages. Experiencing the luxurious rooms at Hawks Cay Resort. Photo courtesy of Hawks Cay Resort. We had a hotel room with a view of the pool and ocean, as spacious, cozy and nautical as the rest of the hotel with its classic West Indies decor. Each room has wireless Internet access, a large flat-screen LCD TV, marble showers and baths, a desk, a balcony and a Keurig coffee maker. Their collection of two- and three-bedroom villas is ideal for families; they feature complete kitchens with granite countertops and stainless-steel appliances, plus oversize decks. Most rooms have water views. Relaxing in the saltwater lagoon. Photo courtesy of Hawks Cay Resort. An AAA Four Diamond Award winner, Hawks Cay boasts a total of 402 villas and hotel rooms, four restaurants, a saltwater lagoon, five swimming pools and an award-winning spa, as well as onsite water sports, fishing charters and Dolphin Connection facility. The Indies Club for kids offers activities with educational components. Kids can participate in noodle races, arts and crafts activities, play video games or just chill out with a fully trained staff. The resort also offers bike rentals, sports fields, and volleyball and basketball courts, and the Dolphin experiences are top-notch for kids. And the highlight? A pirate-shaped theme pool. Lunchtime with great views. Photo courtesy of Hawks Cay Resort. Oceans is the resort’s main dining room, featuring a stone pizza oven and a design that embraces the look and feel of the resort. The restaurant offers buffet and à la carte menus, with plenty of options that appeal to children, and a relaxing environment. The Beach Grill provides the family‐oriented pool and saltwater lagoon areas with a casual menu of delicious fresh seafood, sandwiches and salads, accompanied by a beautiful oceanfront view. Indies Grill is located in the Indies Club and offers yummy meals and snacks for kids of all ages. For families who don’t want to leave their room, the hotel offers full room service. Whatever you do, don’t leave the resort without sampling the Key lime pie. It’s out of this world. In addition to the Indies Club, Hawks Cay has so much to offer kids: a full-service marina with fishing, paddle boarding, sunset sails and jet skiing; a saltwater lagoon for swimming and playing; and much more. The highly skilled team of tennis professionals, led by head tennis pro Michael Stedronsky, offers clinics, mixers, camps and lessons for all ages and skill levels. The Dolphin Experience is the only resort‐based program of its kind, where guests can interact and swim with dolphins in their natural environment, and the only facility in the mainland U.S. that offers free public viewing of trained dolphins. Want Help Booking a Room at Hawks Cay Resort or Planning a Family Vacation to Florida? We can help! Our family-friendly hotel review of Hawks Cay in the CB! Hotel Collection has more information about why this property works so well for families. Use the Check Availability button to reach out for the Best Available Rates and one of our Family Vacation Consultants will follow up to offer guidance. This is a free service. Need more comprehensive guidance? CB! Vacation Consultants specialize in helping families book travel to top destinations around the world. Our expert consultants do everything from recommending and booking accommodations (including qualified options not featured on Ciao Bambino) to developing comprehensive multi-stop itineraries. For more information and/or to request assistance, go to the CB! Vacation Consultants page. Editor’s Note: Hawks Cay provided Holly with a media package to review the hotel for families. As always, our opinions are our own. Photos by Holly Rosen Fink unless otherwise noted.